Copyright Fukushima University All Rights Reserved. Fukushima University inaugurated, on May 18, 2013, Fukushima Fukko Juku, a school aiming to foster young leaders in business, administration and research for reconstruction of Fukushima. 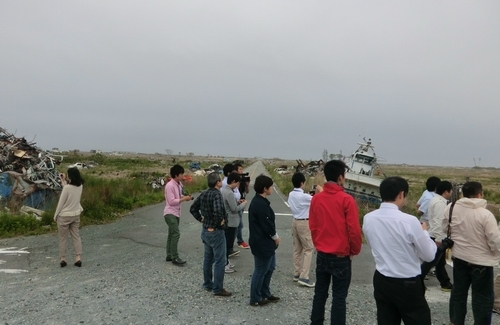 Enrolled in the school were 27 men and women mainly in their 20s to 30s from inside and outside of Fukushima, who immediately launched a research project on the current situation of Fukushima, including a visit to Namie Town, which was greatly affected by the nuclear accident. School lectures will be offered for two years, of which eight months from May through December 2013 comprise the first year. After visiting Ukraine to learn about the nuclear accident at Chernobyl through field work, the students will tackle local problems with four themes: "branding food produced in Fukushima," "creating new local industries," "reconstructing local communities," and "developing a good environment for raising children." The students are expected to solve local problems and contribute to local communities after graduating from the school. The students are from various backgrounds, including entrepreneurs, civil officers, nonprofit organization staff and university students. They include students who came back to their hometown in Fukushima to enter the school with the hope to contributeto the reconstruction of their hometowns and entrepreneurs who wish to contribute to the reconstruction of Fukushima by launching businesses. New networks among the students are expected to help create new projects.